I was thinking of uploading something for Valentines Day but I lost interest on continuing it. I suddenly had an urge to make something else... :| But just to not waste this post I will upload the prototype in case someone gets interested. Note: Yes, I said prototype for a reason and you may notice it in the animation. But there may be ways to avoid capturing the flaws like I have demonstrated in this video(somehow hehe). The normal dance sequence only has two steps. It looked like it had many because I kept on shooting on many different angles that made this video a little longer. As usual this is video is fast forwarded because I make animations slow. 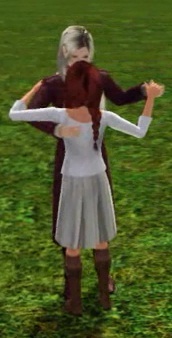 You must play them both at the same time, meaning that you have an animation player for both the man and the woman. When it starts playing, PAUSE at the first pose and then you can arrange the placings of the couples. It should look like the one in the picture here. Everything should follow along when your playing it on a loop. Just keep adjusting the position on the first move. All my couple poses works like this. This should apply as a guide for the future couple animation that I will upload. Unfortunatly this anim is just a prototype but I will try to fix it when I get the chance (and mood ^^). Disclaimer: I sort of referenced from another creator which is here LINK -from stars blog. But I modified the males height and some postures. Do you ever think you'll continue?! This is what I've been LONGING for; a good dance animation! You're a very gifted animator. I was wondering if I could use some of your animations for my sims machinima, I'd give you full credit and link back to your blog. There are some animations that aren't uploaded though but that's because they aren't properly fixed yet. I only share what I think is worth sharing. Thanks again for finding my animations to your liking.